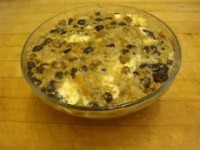 Here is a very traditional English (or Canadian) Plum (or Figgy) Pudding recipe. It is usually made in October and kept wrapped in a cloth drenched in brandy in a cool place. 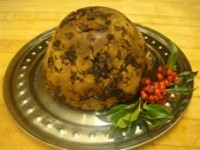 Then, it is steamed for 3 hours on Christmas morning and served with Brandy or Hard Sauce. Mix all the ingredients together thoroughly and add enough brandy, rye, old ale or milk to moisten the whole. Pour into well-buttered molds and leave sit at least one day (preferably 2 weeks). 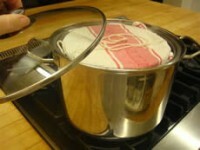 Cover with buttered paper or tin foil and tie it securely in place. 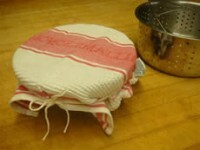 Put the molds in a pan of water or steamer and steam for 8 or 9 hours. Serve flaming in a little brandy and with hard sauce. Beat the eggs well and stir in the sugar. Add the butter, brandy, and rum. Fold in the cream that has been whipped until stiff. Serve at Chrismas-time with mince tarts or plum pudding. 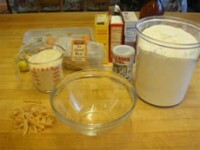 Place the butter in a bowl and beat with an electric mixer until light and fluffy. Add the sugar and salt and slowly mix in the Cognac. 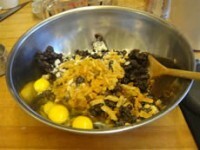 Beat the mixture about 5 minutes more. Thoroughly chill before serving.